An oil created by blending extra virgin olive oil and olive pomace oil using the solid remnants of the olive stones, skin and pieces of ground pulp. This paste undergoes a second extraction and refining process. 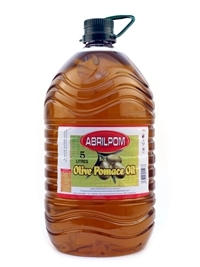 Combines all of the heart-healthy properties of extra virgin olive oil at a reasonable price. Ingredients: Refined olive pomace oil, extra virgin olive oil. Nutrition: Per 100ml. Energy 3700kj/ 900kcal. Fat 100g (saturated 15g). Carbohydrates 0g (sugars 0g). Protein 0g. Salt 0g. Our company is called Abril (April in Spanish) because this is the month when the olive trees start to flower after the winter, and also in honour of the April Fair in Seville that our father Manuel loved so much, as this is where he would go to meet all of the producers from the olive oil sector, where they’d talk about the harvest that had ended just a few days before the fair, and make all the necessary arrangements for the business transactions for that year. Since the company was established and during three familiy generations, the purpose continues for improving the quality of our products and the improvement of our site, to be able to provide the best possible product to our final consumers. 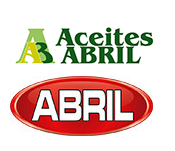 Aceites Abril offers a wide variety of formats adapted to the needs of our clients, and a wide range of types of edible oils: extra virgin olive oil, organic extra virgin olive oil, extra virgin olive oil from the arbequina, hojiblanca and picual varieties, olive pomace oil, sunflower oil, vegetable oil and special frying oil.